Over the years, nonprofits have become terribly polite. They sometimes advocate strenuously, but tend not to take to the streets and engage in direct action. Sometimes, when the issues involve human rights that are repeatedly ignored by the authorities, some nonprofits come to think that civil disobedience might be necessary to dramatize their importance for the public and for the corporate or governmental authorities involved. That, apparently, is the case with the shutoffs of running water for half of the city’s water customers. The Detroit Water and Sewerage Department has taken modest steps in the past week in response to criticisms from a handful of nonprofits and from Congressman John Conyers, but hardly enough. Sending notices to commercial and industrial customers owing tens of thousands more than the typical delinquent residential bill of a couple of hundred dollars and creating a $1 million fund to assist residential customers when they owe a cumulative $41 million doesn’t do the trick. For some grassroots groups in the Motor City, watching low-income Detroiters lose access to running water is watching a violation of human rights and, in terms of nonprofit activism, a civil rights cause. Fifty activists protested last week in front of the offices of Homrich Wrecking, the company Detroit Water hired to turn off residential taps. 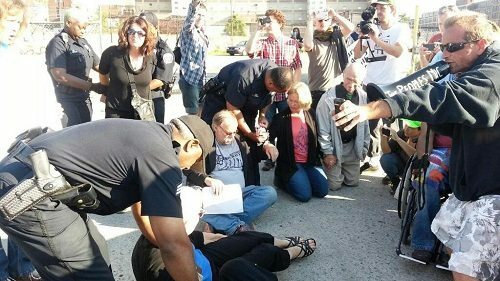 Nine were arrested for temporarily blocking trucks from leaving the company’s parking lot. Among the arrested were a Catholic priest, a nun, and a pastor. If you have a sense of history, the actions of the protesters—from the Detroit Water Brigade, the grassroots group that played a large role in the protests leading up to this action, and the Detroit Water Warriors and the Call ’Em Out Coalition—feels like a replay from the Civil Rights era, with a largely African-American population deprived of the basic necessities of life and protesters taking to the civil disobedience to galvanize the attention of the public. Al Jazeera notes that a group from Windsor, Ontario brought 1,000 liters of water into Detroit to help people who have been deprived of this necessary basic service. An interactive map on the Detroit Water Brigade website identifies those residents in Detroit, Highland Park, and Hamtramck who haven’t had their water turned off and are willing to provide water to neighbors and a couple of central resource hubs offering water jugs and iodine tablets. What a nation! In Detroit, we have caring individuals and a few nonprofits—with assistance from Canada—providing water to Detroiters whose taps are dry. UNICEF reports that 768 million people in the world are dependent on unsafe drinking water sources; DoSomething.org says the number is more like 884 million. Now we can add the 150,000 Detroit water customers who have been classified as delinquent on their bills, including the 17,000 customers who have already had their water turned off this year.